Now the entire Haunted Tombstone Collection (the original tombstone, the second taller tombstone, and the two together in one video frame) are available as a single download for $40. You will receive a link to download the videos to the email address provided to Paypal within 1-2 days. The Haunted Tombstone is a series of very simple projection effects that anyone with access to a video projector -- any video projector -- can do. You simply project my animated tombstone video onto a blank tombstone that you cut out, so it's sure to be just right for your haunt. Watch the demo video below to see all the cool, creepy effects, and scroll down a little further for the how-to video. The Haunted Tombstone video loop is included (in HD and standard definition .mp4 format) in the download. The Haunted Tombstone 2 works just like the original, but has a new shape and new effects. Check out the video below. The Haunted Tombstone 2 download includes the video loop in HD and standard definition, each in portrait, and landscape (4 files, .mp4 format). But wait, there's more! I've also put both tombstones side by side into one video, the Haunted Tombstone Set, so you can project them both at the same time. The timing of each has been reworked so they play off of each other a little in this version. 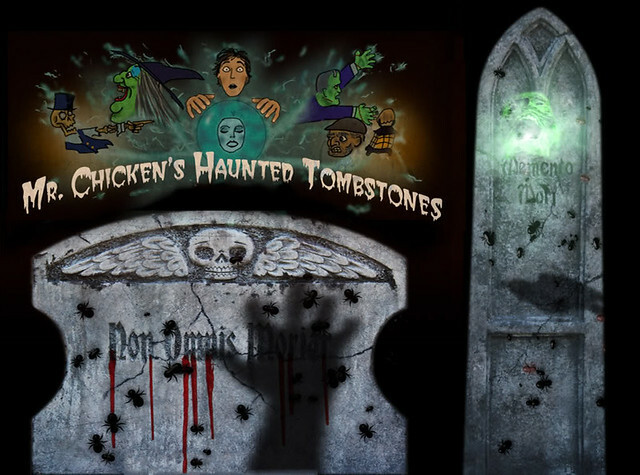 The Haunted Tombstone Set includes an HD and SD video loop in .mp4 format. These downloads are licensed for personal (home haunt) use only. Commercial attractions should contact me at the address below before purchasing.